At least 23 people were killed and over 80 others injured, some of them critically, on Saturday after a passenger train derailed in northern Indian state of Uttar Pradesh. Photo taken on on Aug. 19, 2017 shows the site of a train derail accident happened at Muzaffarnagar, Uttar Pradesh, India. At least 23 people were killed and over 80 others injured Saturday after a passenger train derailed in northern Indian state of Uttar Pradesh, local media reports said. At least 23 people were killed and over 80 others injured, some of them critically, on Saturday after a passenger train derailed in northern Indian state of Uttar Pradesh, police said. According to Indian railways spokesperson, 14 coaches of the train derailed in the accident. The accident took place in Muzaffarnagar district of Uttar Pradesh, around 100 km from New Delhi, India's national capital. A derailed coach hit a nearby house, damaging it severely, reports said. "Today a train derailed here causing coaches to fall upon one another," a statement issued by Uttar Pradesh police to local media said. "In this tragedy, 23 people were killed and over 80 others injured, who were admitted in different hospitals." There are fears some passengers might be caught inside mangled coaches and death toll is likely to increase. Officials said the injured were being admitted at Khatauli, Meerut and Muzaffarnagar hospitals. Authorities have rushed police and disaster response force personnel to the spot to carry out rescue work. The rescuers were seen using gas cutters to cut the steel and help the people trapped inside the coaches. A crane has also been brought to the spot to lift the derailed coaches. Television images showed huge crowd gathered at the accident site. 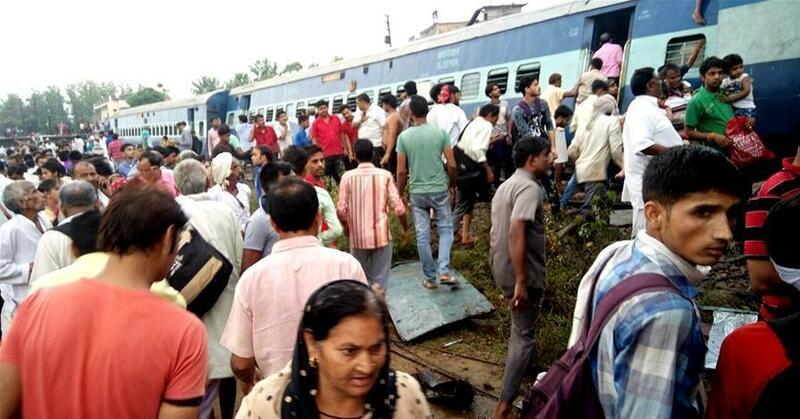 The train Utkal Express derailed in Muzaffarnagar's Khatauli area at around 5:45 p.m. local time. Railway ministry officials said the cause of accident was not immediately known. The Indian railway ministry has ordered an inquiry into the accident. "Have ordered inquiry into the unfortunate accident to ascertain the cause. Strict action will be taken against any lapse," Indian railway minister Suresh Prabu said. "I am personally monitoring situation." Following the derailment, locals first rushed to the spot to help people trapped in the derailed coaches and subsequently informed the police and railway officials. "Most of the rescue work was carried out by locals. Official assistance reached late," Atul Srivastava, a local volunteer, said. The Indian government has announced a compensation of US$7,792 for each family that has lost a member in the accident, while the injured will be given an assistance of US$1,558 each. Meanwhile, Indian President Ram Nath Kovind and Prime Minister Narendra Modi have expressed grief over the accident. "Extremely pained by the derailment of the Utkal Express in Muzaffarnagar. My thoughts are with the families of the deceased," Modi said and wished a speedy recovery for injured in the accident. "Railways Ministry and Uttar Pradesh Government are doing everything possible and providing all assistance required in wake of the train derailment," Modi said. In January this year, 39 people were killed and over 50 injured in train derailment in southern Indian state of Andhra Pradesh. The Indian government in 2015 announced an investment of over US$137 billion over a period of five years to boost railways and modernise it on new lines. Indian sprawling railways are the world's third largest network, ferrying around 23 million people each day. Last year a train accident in Uttar Pradesh killed 145 and injured around 200.